Last winter I built several projects for AMD to highlight their new line of APU’s (Accelerated Processing Units) which are combination CPU’s and graphics card on a single die. 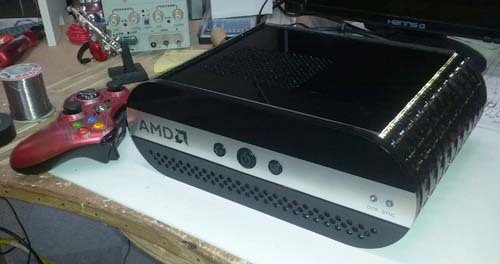 Most of the projects used concepts from AMD, but for one showcase item I got to build “whatever I wanted” so I took a crack at my rendition of a living room PC that could function as a “Steam Box”. Please note this isn’t associated with Steam/Valve, rather it’s my own concept of how a living room “Steam Box” could be put together. Click below to see the making of! Want to discuss a project for your company, personal use or promotional needs? PS4 Single Handed Prototype Complete! New Single Handed Controllers Now For Sale!